There's a problem I do not remember seeing before, so I decided to note it here. A 50'' plasma HP PL5060N has come in for repair with typical sustain problem - burned fuse, power with no image. Turned out it was the Z sustain and after replacing the two IPMs YPPD-J015B and YPPD-J016B with new modules and doing some quick tests I plugged the board back in, replaced the fuse and turned on the TV. The TV showed up the HP logo for a few seconds, then turned black and restarted itself. At first I thought the problem was in the main board or the power board, since I got good image on screen if only for a few seconds, suggesting sustains were normally functional. But I had a spare Z sustain board and for my luck decided to see if it will make the TV behave differently. Surprisingly, it worked out well with it, something I frankly did not expect. 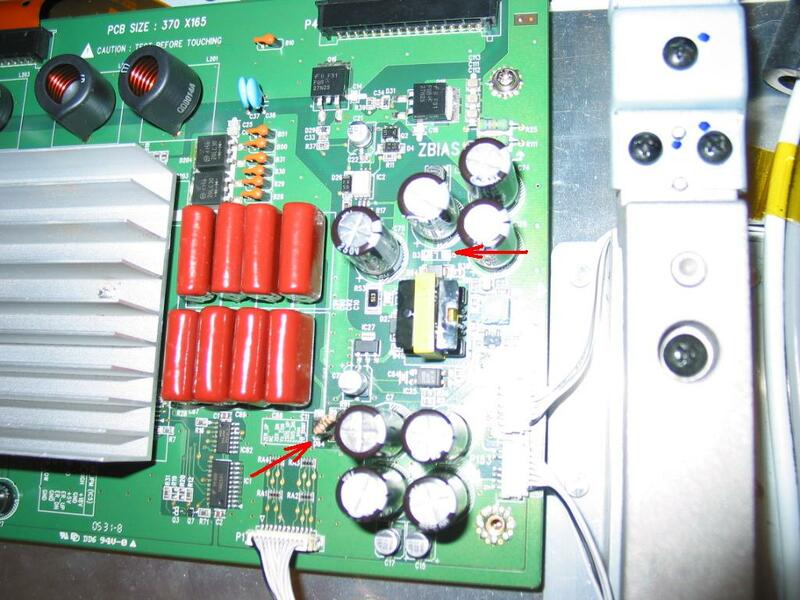 I am glad I tried, because I would have sworn the problem was in either main board or power board. The R9/R91 resistors were both burned and the D3 diode was shorted. The R9/R91 are connected in parallel for a resulting resistance of 5 Ohm. I didn't have SMD resistors like them handy, of course, so I just replaced them with generic 0.125W pair of 10 Ohm resistors connected in parallel. D3 is apparently a protection diode. It was completely missing in the 6870QYC004B version of the board that I had and which was functional. Call me what you like, but I had decided to leave it missing in the 6870QZC004A version as well. After fixing R9/R91 and removing D3 the board allowed the TV to continue beyond the HP logo. If you want YPPD-J015C or YPPD-J016C for your own DIY project or if you want your Z-Sustain or Y-Sustain repaired check out my store. Have this same tv. Last night there was loud pop and the screen went blank. It proceeded to try to turn on and then shut off (there was clicking and the on/ off light blinking ). Opened up the back and nothing seems wrong visually any ideas would be appreciated. I've got an HP PL5060N and I've had very good luck with it until recently. I turned it on and a third of my screen is blank. The other two thirds is fine and operates normally. The picture you can see is great, just missing one third on the left. Any ideas? ok...im sorta confused as to how i "replace with .125W pair of 10 Ohm resistors connected in parallel" does that mean that i soldier one each replacing each surface mount with one each generic? the photo is hard to see.. it look like you soldered two together and soldered them diagnal.. sorry if im sounding idiotic.. im new top this ..